Not a lot of info available on this one. From what I've seen, Monkish Brewing doesn't tend to give lengthy descriptions of their beers. In short, this is a Double IPA brewed with Citra and Amarillo. Pours a hazy, golden orange with a finger of white head. The taste is surprisingly more bitter than anticipated, but fortunately the juicy qualities help counteract it. Really, it's the front that has the initial pop of hop bitterness, but it is washed away by the orange juice (with tome tangy qualities). The transition has something I've never quite experienced before, and that is something I would call "carbonated doughy malts". There's a big bready quality to it with a small amount of lemon zest and a sprinkling of pine for good measure. The finish goes back to the acidic grapefruit with a sweet, dessert-like taste. Mouthfeel is perfect. You'd never guess it is an 8% DIPA and the carbonation is spot-on. Drinkability is through the roof as I am crushing my 16oz can. My First Canning Line DIPA made great use of the Citra hops and the final product was a highly drinkable Imperial IPA with lots of complexity. 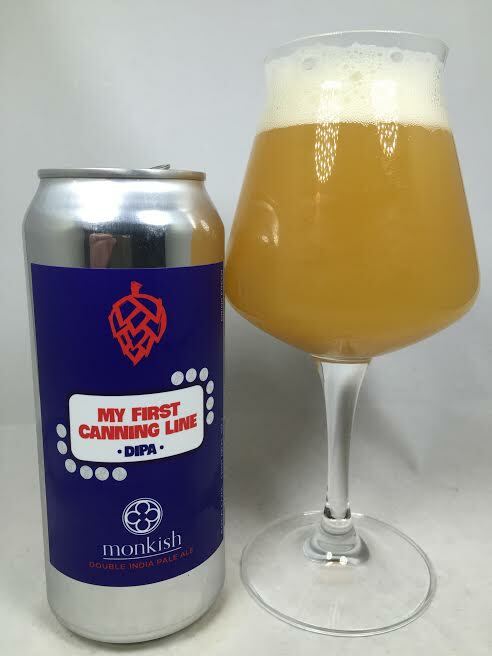 I am two cans into my Monkish beers and so far they have been impressive with their highly hopped, juice bomb IPAs. More please!